The notion of the official single is gradually dying, suffocated beneath Soundcloud embeds and, at the other end of the spectrum, event-release visual-albums. At the same time, the internet’s atomization of music consumption and the erosion of the traditional full-length has meant that songs—standalone tracks—are more important than ever. Perhaps that’s why your votes for the Best Song 2013 category were so damn broad, with a solid consensus hard to strike. Still, after much counting, verifying, and disqualifying (“Latch” came out in 2012—you should know that because it topped last year’s poll) we got there. Whether a hearty slab of vinyl or a cluster of megabytes, here are the tracks that soundtracked your 2013. And not a Blurred Line in sight—high fives all round. Last year you voted for Disclosure‘s “Latch”, Grimes‘ “Oblivion”, John Talabot‘s “Destiny”, Burial‘s “Kindred” and Andy Stott‘s “Numb”. Can you get even more diverse this year? Let’s see. With a well-received and artistically advanced second album Cold Spring Fault Less Youth in the bag, London’s mildest of beatmakers finally busted out of the post-dubstep annex they’d been backed into. “Made to Stray” was Mount Kimbie in confident voice—literally, Kai Campos proved he was more than ready to get behind the microphone and play frontman. The Plastikman snares helped too, of course. When we premiered the “Vocal” video back in June, we were immediately taken with PSB’s swift return to their electronic roots after the somewhat middle-aged Elysium. Sure, a heady dose of nostalgia ricochets off those synth stabs and ridiculous snare rolls but hey, you know who’ve earned it? Pet Shop Boys. There’s an argument that Electric was a return to the heady days of Behaviour and Actually. This is one of the reasons why. Despite the album being a bloated disappointment, first single “Reflektor” aced it. Producer James Murphy seized upon the awkward, oh-so-pale funkiness that the Montreal band had flirted with on The Suburbs and stretched it out for seven-and-a-half minutes and two videos. Somehow, it could have gone on for twice that length and we would’ve been cool with that. Also, it features Davie Bowie on backing vocals. No biggie. 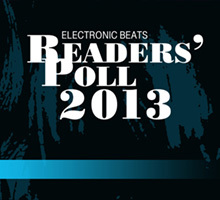 Click here for more results from our 2013 Readers’ Poll.